We surely want all our private conversations to stay private. This is but simple and natural for any person. If we text or voice chat with someone, we want to be sure this space is personal and well-protected. Especially given that we occasionally send sensitive information that may be related to our family, health or business. We traditionally welcome the new mildly obtrusive offer from Microsoft. 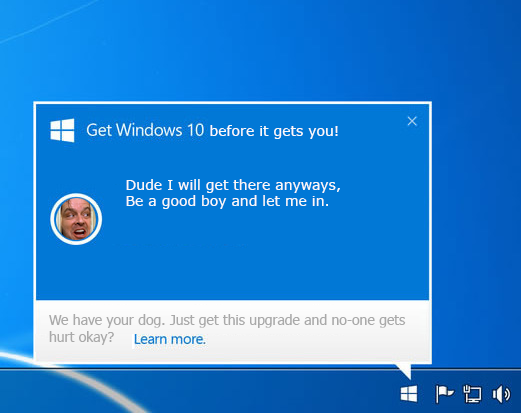 This time, of course, we are urged to upgrade to Windows 10. Not only are we urged, but rather Windows 10 makes broadband haste to our PCs, without much ado (or permission). We couldn’t let this pass unattended, so here’s a quick how-to on removing the unwelcome guest. IPv6 is a network layer protocol which provides addressing and routing between hosts in a network. This is a new version that will supersede the older one (IPv4) someday. It also brings new features and aims to solve some problems, including the notorious depletion of available addresses for hosts. This is the main problem that exists today with IPv4. No doubt Internet has dramatically changed the way people live and work. All this has been made possible by a set of different technologies. But nothing is perfect. Those technologies are not an exception. One of the core parts of the Internet is the Domain Name System. DNS does have certain issues but the respective organizations are working hard to continuously improve it. Below we’ll explain what DNSCrypt is and how it helps users, and we’ll provide instructions how to set it up. In our previous Android security roundup we made a breakup of major Android versions for smartphones vs. their security. In this roundup we’ll be providing apps and system settings for better Android security. Is Your Android Device Secure Enough? How safe is my Android? Which Android version is best protected? Are legacy versions targeted by hackers? If you care about your personal data security, you've surely asked yourself one of those questions. In this brief roundup, we’ll cover all major Android versions for smartphones and provide best security practices and useful links for each one. Do you often need to remotely access a powered off machine? Even if it’s a rare occasion, it’s often “you get remote access or you drive 80 miles”. That’s why you rely on Wake on LAN. WOL certainly requires some setup, depending on the OS, and it has certain caveats that we explore in this guide. This guide is now available in the Help section here. Privacy issues always attract close attention. So, we explored important security-related web browser settings and popular tools (extensions) that make your web surfing safe. You obviously don’t have to install them all. Feel free to pick whatever you like and see how it works for you. Also, you may scroll down to final words to see the best combo for a privacy concerned user. While a CRM system may automate many workflows within a company it is mostly concerned with customer relations. It’s designed to automate mundane jobs like report generation (including financial reports) and support interaction with the customer, keeping all your data and processes in a centralized manner: store contact information, conversation and billing history, streamline lead generation, do template-based replies, escalate tickets, etc. On one hand, it saves you time and effort. On the other hand, it improves customer experience with your company. An all-around win. Remote support saves time and effort but what if your user can’t get online? This simple troubleshooting checklist helps you get connected. It might be useful even for experienced technicians, especially at the end of a long business day.